How are the values for Table 10-8 of AISC Manual derived? I have read the commentary before the Table that it used the elastic method to calculate those values. I have tried solving (posted below) but can't seem to get the values written on the Table. To be fair, I am not sure with the eccentricity to be used. Where did I go wrong? 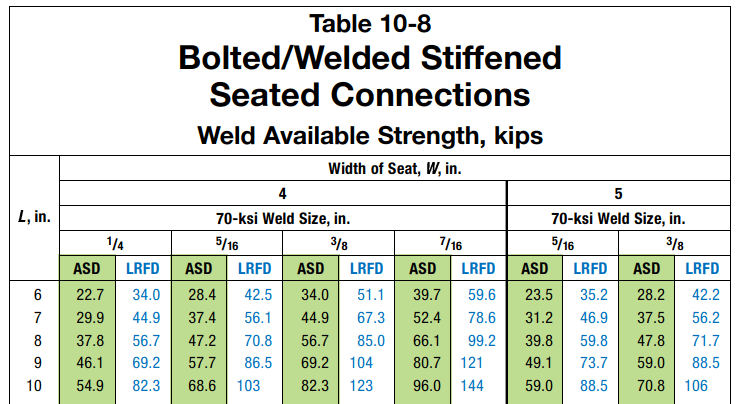 Are you taking advantage of the fillet weld strength increase when loaded perp. to the weld longitudinal axis? Looks like you're not taking the horizontal portion of the seat weld (0.4L, shown in figure 10-10) into account with your calculations, which the tables do account for. Also the force P is assumed to act at 0.8W for the computation of the moment on the weld group, so the moment would be 0.8W * P.
The basis for the tabulated loads in AISC 360-10 Table 10-8, as limited by weld strength, is derived in "Design of Welded Structures" by Blodgett in Section 5.3. The derivation can also be found in "Steel Structures - Design and Behavior" by Salmon and Johnson in Chapter 13 (fifth edition). The derivations assume two (2), L-shaped welds attaching the stiffened seat to the supporting structure. An increase in weld strength due to direction of load relative to the weld axis has not been taken into account. Note you must check the supported beam for web local yielding and web local crippling. Thank you! I finally figured out the Table with the help of your comments. It turns out, I have been wrong on quite a number of things. 1. Eccentricity is indeed at 0.8W, just like @sbisteel has said, which is also stated in the AISC Manual. 2. Horizontal welds with total length of 0.4L were not considered. 3. The part to be considered for the bending stress is the topmost part and not at the bottom. Is there a reason why the eccentricity used is 0.8W? Also, why is the topmost part considered and not the bottommost (which has a higher stress than the top)? The bottom portion of the stiffened seat is in compression, bearing against the column. I believe the idea behind the 0.8W eccentricity is that as a simply supported beam deflects, the end closest to the column will want to lift off of the seat, pushing the bearing stresses out towards the end of the connection. I agree with sbisteel's comments. In response to your last question, it is my understanding that laboratory testing has confirmed the validity, and reasonable conservatism, of the current approach with regard to weld strength. For a bit more insight and discussion of the conservatism of the current approach, you might be interested in an article ("Economy in Stiffened Steel Seated Beam Connections") by Skourup and Zottola in the September 2008 issue of STRUCTURE magazine (www.STRUCTUREmag.org).